During the coaching change last fall, I discussed the various positions with some friends who were plugged into the coaching community. The general consensus was that BC was not as good a job as some of the others available at the time. One job that was supposedly better was NC State. That had me scratching my head. Tom O'Brien had just proven that it was easier to succeed at BC than in Raleigh. But the argument for NC State was the same thing you always hear: better facilities, easier recruiting, and great fans. Yet all that great potential hasn't led to much success. In fact, NC State is where coaching careers go to die. Long-time ACC writer Caulton Tudor noticed that most ACC jobs lead to firings. But I think it is a bit different at BC. We may have fired four of our last six coaches, however, an argument could be made that two of the fired (Bicknell and Jags) could have used BC as a stepping stone had they had better foresight or timing. Bicknell missed his window and passed on bigger jobs. Jags tried to jump too early and saw it all blow up in his face. The two that got fired without any prospects were Spaz and Henning. They share some of the same characteristics including that they never should have been hired in the first place and both were a little old for the job. Age is a factor in all of this. If you are young and hungry and ready to prove yourself, BC can be a great place. Expectations -- even among bloggers -- are relatively low. The Boston media is passive, as is the fanbase. Those might keep some from wanting the job, but that low pressure environment should be enticing to someone who wants to build a career. Addazio is positioning himself as a lifer at BC. Odds say that won't end well. However, if history holds, he will have other opportunities in four of five seasons. I am not worried about him taking a new job either. There will be a smart opportunistic coach ready to fill his shoes at BC. Steve Addazio spent Tuesday in Bristol visiting various ESPN personalities. BC did a good job of capturing his different stops. Videos of the different appearances are not up yet, but should be late Tuesday or early Wednesday. In my opinion one of the better showings was his ESPN chat. Chats have been the bane of many BC bloggers, but this one had a fresh feel. And the some of the purposely trolling questions got through! The whole transcript is here. I found the following exchanges interesting. Hey Coach Addazio,A lot of writers are picking Boston College to finish near the back of the ACC. What do you have to say to that? What I tell the players is we're picked where we should be picked coming off a two win year. It's up to us to establish the 2013 team. If you're a competitor, those things bother you. But we have to go do the things we have to do to change it. You've honestly been more open to the media than your predecessor as evidenced literally by this chat. Do you think there is an advantage to being more open? Yeah, I think I believe in being transparent. I want people to think they're a part of the program. I think people get more energized when they feel like they have access to the program. As a former offensive line coach/player, what is the single biggest problem you have to fix with players when they first come to college? What specifics do you look for in a offensive line recruit that differs (if at all) from other positions ? Traditionally, it's in pass protection. I think it's the hardest thing for high school OL as they adapt is the multiplicity of protections, technique and the speed of the players coming at him. Addazio has been a popular topic for ACC writers. Here is another profile. Rettig's playbook challenges including trying to spit out Kevin Rogers' NFL lingo. BC hasn't been that great against the spread over the past ten years, however, the past few seasons really skewed the results. BC is recruiting a Matt Ryan for basketball. That won't be confusing at all. The media thinks BC will finish last in the division. Vegas has a little more optimism but still puts our win total at 4.5. People close to the program think it would be a miracle if we got to six wins. I am not ready to publish my game-by-game predictions, but I do think we are going to be a good road team this year. I like Doug Martin and respect his familiarity with our roster, but we will beat his New Mexico State team in Las Cruces. They are terrible. Road games can be tricky but by November, when we play them, we will be battle-tested and have a much better understanding of our strengths and weaknesses. Our talent is not BCS level, but it is still much better than New Mexico State's. This game will be a "W."
The Aggies only count for one victory. Our others are a bigger question mark. I don't think much of USC but the talent disparity is in their favor and playing in the Coliseum is tough. At Clemson seems very unlikely at this point. We've never beaten North Carolina as a member of the ACC. That leaves Maryland and Syracuse. We finish our season with the Terps and Orange on the road. I know that each game is an individual event, but I do think confidence and early success can impact how a team plays later in the season. I wish we played these two earlier. We very well could enter the stretch at 2-8. But that is where I think the new coaching combined with the veteran team helps. I know Addazio will be pulling out all the stops to get a few more wins. I also know that our seniors will want to end their disappointing careers on a high note. I think we will be super motivated. Conversely, I also think Maryland could be in a fragile state. It is their final ACC season and they could very well be ready to fire Randy Edsall. Syracuse is at a more stable position, but you never know how they will be after a 11 games with a new coach and new conference. I think three games are very winnable Maybe we will even surprise one of our other road foes. Either way, we are getting to three road wins. I thought this was a good feature on Chase Rettig. I would love to see the stacks of playbooks he's kept. An enterprising TV producer will get a shot of the binders and put it on during a game this year. BCI and a Wake Forest blog are helping a food bank. Find out more here. Dan Koppen tore his ACL. Given his age and injury history, this might mean the end of his career. The season is approaching so it is time to catch up on your previews. Here are a few from Paul Myerberg that we haven't highlighted yet: Wake Forest | North Carolina | NC State | Syracuse. The Hurricanes signed Nathan Gerbe. Women's basketball will play in the Cancun Challenge. Somewhere on Chestnut Hill, the BC Office of University Advancement is frantically trying to get Matt Ryan on the phone. Swofford’s new talking point: ACC additions & grant of rights have “stabilized” college athletics. Never mind ACC kickstarted it all. Well, took all of five minutes in O'Hare to run into someone from school unexpectedly. Reminder: BC is everywhere. The Athletic Department's Facebook page posted this picture Thursday. It is the front page of the Globe the morning after the Flutie Hail Mary. My family was living outside of Boston at the time and I vividly remember this edition of the paper. I thought it was so cool to have the two pictures split and the path of the ball in the air. I don't know when BC sports will be the top story on the Globe/Boston.com again. They just don't care. We would have to do something on the level of Flutie for them to lead with BC. I also don't know when the Globe would ever get that creative with anything related to BC sports. This probably sounds more like a grumpy fan whining about the media than I want it to. I guess I long for the days when a newspaper or new organization can leave a lasting memory like this. This page added to my experience of the game. Let's hope we have some memorable games in the near future and all our outlets (blogs, social media, message boards, etc) react and enhance the games like the Globe did that day. I assumed that Steele Divitto would get preseason All ACC votes simply be being at the ACC Kickoff. Instead the media awarded KPL. Congrats to him. He certainly has the tools to be great. I hope the new defensive system allows him to shine. The basketball team will also play USC this year. That will be a nice coming home for all of our Californians. I hope the Pac 12 Network isn't an issue with this game. The Philly media likes the Momah story. Let's hope the coaching staff does too. This isn't BC related, but Stanford is rolling out dynamic pricing for their seats. If it works for them, it will be at Alumni shortly thereafter. This prediction is not intended to disparage Andre Williams. It is more about our running game and the frustration I predict for this season. Addazio has made it clear he wants to run the ball. Or at least establish the run. But just because he wants to run doesn't mean BC will do it well this year. Our offensive line hasn't been good for years and lost two of its better starters from last year. Word out of Spring Ball is that the offensive line was still a "work in progress." There are talent issues, depth issues and relearning some fundamentals. A great offensive line coach can perform triage and miracles. I have hope for Justin Frye, but he is still very young. Maybe he will get the line to come together right away. I just have my doubts. I take Addazio at his word that he will pass the ball this year. Rettig is his best offensive weapon and he can get rid of the ball under pressure. Throwing a lot will limit Williams' carries. Finally, I think we will see much more running back by committee this year. If Kimble stays healthy, he will get plenty of opportunities this year. Myles Willis will get a chance to play right away. Dudeck was a Spaz favorite, but I see no reason why he wouldn't get some playing time. As much as I would love to see BC's offense explode this year, I know we will struggle at times. Based on impressions and gossip in spring, most expect those struggles to come from running the ball. I wish Williams the best, but don't think he's going to surpass last season's totals. The second day of the ACC Kickoff focused on the coaches. Addazio did the rounds, including this sitdown with the ACC Network. The assembled media picked BC to finish last in the division. I don't think anyone was surprised. After a 2-10 season, how can you not? Addazio made positive impressions on the media. Steve Addazio just used his nametag as a prop. Pretty sure his predecessor wouldn't have done that. Some writers are still surprised that our head coach is serving as his own recruiting coordinator. I was surprised that the Globe has not written anything. Based on his tweets, it seems like Vega is there. Maybe I overestimated his excitement about returning to the BC beat. Divitto and Rettig were very busy Sunday. They did a whole round of TV and print. Both did a great job representing the school and are getting me excited about the season. Here are some of the better links from Day 1. Monday will have more on Addazio and a few features on the players. The "dude" thing is gaining notice. I loved the way Divitto explained it. At this point you either get it or you don't. Addazio taped some TV spots that aren't live yet, but fortunately BC's twitter account tweeted some of the highlights. Chase Rettig gave all the right answers and conducts himself well. However, I don't get the feeling that he loves doing this sort of thing. Here is Meter at the BC table. The ACC kicks off its Media Days Sunday. The event is actually a decent opportunity for BC. With so much of the assembled media not from New England, this is one of the few times we will ever get coverage in traditional ACC country. Plus our representatives usually come off well and it gets noticed. This is also Addazio's first time representing BC among the conference media. I expect them to welcome his passion and candor. Joining the coach will be Chase Rettig and Steele Divitto. The team usually selects seniors whom they expect to have a big season, so view it as a vote of confidence for both players. There will be plenty of coverage on all different outlets, so look for these themes and questions as the events unfold. -- Addazio getting asked a lot about Tebow and Hernandez. This is the most predictable portion of the weekend. Fortunately Addazio is used to it by now. I expect him to give generic non-answers and when appropriate steer the conversation back to BC. --Steele Divitto to make an all conference team. The QB position is too much of a logjam for Rettig to get on a preseason ACC team, but I think Divitto will. Don't mistake his votes for respect among the ACC Media. Many times players who attend get an added boost because they are top of mind. -- Everyone to get asked about Boston Strong and the Marathon. 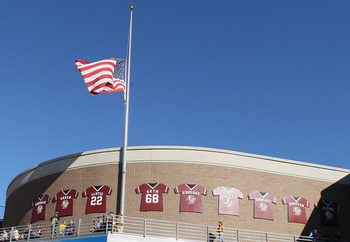 With the way our collective memory works, many have already forgotten about the bombing, but I think the media will ask...even if it is just as simple as "how did not having a Spring Game impact your preparation?" -- BC folks will be asked non-nonsensical questions about Pitt and Syracuse. Someone will ask something about the new "northern" schools joining in some fashion since BC is still viewed as the odd duck by many old-time ACC reporters. The only issue I have is that none of our current players ever went through a conference switch and don't really have a relationship or rivalry with Pitt or Syracuse. -- The voters will put BC near or at the bottom of the division. Expectations are low. Very low. I don't care though. I just hope Addazio can use it as motivation. Greg Joyce is no longer a BC student, but he's still writing about the Eagles. In this feature, he spends time with Steve Addazio on the Cape. I know I should be cynical about this stuff, but I really do feel that Addazio is where he wants to be. I don't know if BC was really his "dream job" more than UConn or even Syracuse, but I think being in New England and near his family will make this job and rebuild all that more special to him. When he's done with his summer vacation, Addazio will head back to Bristol for ESPN's Car Wash. Addazio will be part of the ACC contingent on July 30. Andre Williams is a preseason Doak Walker candidate. Momah keeps earning good mentions out of Philly's camp. Joe Tessitore's tone and pronunciation of the phrase "player hating" is the best thing to happen to college football all offseason. Spurrier sees Muschamp's "Ohio" jab and raises a "Notre Dame to the ACC." The master has arrived. The ACC unveiled its new bowl deals. Orange, Russell, Music City, Sun, and Charlotte return. The Gator Bowl is back and we are now part of the Pinstripe Bowl. The Peach Bowl is gone because it has been promoted to the new playoff, however, the ACC will get its No. 2 team in the Citrus Bowl any year the Big Ten No. 2 is in the Orange Bowl. From a PR and recruiting standpoint, this is probably neutral for the conference. We lost the Peach but will likely get the Citrus more often than not. But none of it matters for BC and ultimately I don't think it will matter much for most ACC teams. BC fans shouldn't care because we are still in an Orange Bowl or bust mindset. BC is never going to be picked by any of the other bowls unless the bowl is forced. In good years we will go to Charlotte. In bad to El Paso or the Bronx. Does that really make a difference to anyone? If anything I think most BC fans would prefer the less prestigious Pinstripe Bowl over El Paso anyway. Most ACC teams shouldn't care about this much either. This current bowl cycle deal is for six years. I doubt it will even need to be that long. I predict the playoff will be such success and such a form of controversy that it will expand to eight teams within three years and it will probably expand to 12 within five years. Once the playoffs become that big, the bowls will be a shell of themselves. Until the bowls die, I just want to see BC in one again. That should be our only care and focus. Once we knew that both BC and UConn were in the 2k Classic, an official pairing seemed inevitable. The organizers agreed and the two former Big East foes will face off in the Semis. I know none of the current players, coaches or ADs share the bad blood, but the fans still do. I hope we win convincingly. Not only will it mean some revenge, but it will also be a huge RPI win for a BC team that will probably need one. Sarah Marshall Ryan took a job with the Atlanta Dream. Austin Tedesco's preseason basketball coverage continued with a Q&A with Anderson and Hanlan. Experience pays off for college QBs. Let's hope it holds true for Rettig. BC is doing a good job of getting our players on the PreSeason Watch lists. Amidon made the Biletnikoff list. If I had just said we would outdo the last two years (6 and 11 sacks respectively) it would not be that crazy. But if you include Spaz's 2010 season our three season sack total is 37 sacks. For a group that only produced 6 all of last year, that is a big jump. And it is not like the incoming talent is making me so optimistic. My expectations are high for one reason: Don Brown. I started my previews focusing on Rettig, since I believe that he is the primary key for the year. A close second is our new defensive coordinator. If we are going to surprise people this year, we need Don Brown to make lemonade out of the lemons guys left behind by Spaz. I think he can do it. His defenses at UConn carried their team and he was respectable in his stint in Maryland. My lasting memory though is his 2007 UMass team frustrating Matt Ryan with varied blitzes and pressure. Now just because Brown likes to pressure QBs, doesn't mean sacks are just going to happen. Someone has to make the actual tackle. That is where my prediction gets a little fuzzy. At UConn the LBs were able to break through and get pressure. So you have assume that someone with a little speed like KPL will be effective. I also think Duggan will get some on delays or just straight pressure up the middle. As for the DLine. If Ramsey stays healthy, he can create big holes. Edebali is a great effort guy (who just never seems to get there in time). Maybe in the new world he will be more productive. Our corners will be playing closer to the line of scrimmage, so ALJ and Jones should get a sack or two. UConn had 33 sacks last year, so getting to 38 is not unthinkable. BC plans on being aggressive on both sides of the ball, so I expect teams to try to throw on us (a lot). If Brown does a lot with a little, I will be very excited about the future when he gets his own players on the field. The aggressiveness will lead to some big mistakes this year but the days of bend but don't break are finally over. Based on how his recruitment the past few weeks, it is no surprise that Matt Morrissey picked Michigan State. The only real reason it is news is that it is rare for Addazio not to close a kid like this. Morrissey is the younger brother of former BC linebacker Mike Morrissey. But we lost out to a program he also had ties to and a program in the Midwest. Austin Tedesco posted a really good preview of the basketball team. I am a big believer in experience and the raw numbers are staggering in BC's case. Donahue needs to turn that experience into wins. Divitto is on the Butkus watch list. I don't think any of our defensive players are going to get enough tackles to get national awards. ESPN's Adelson broke down BC's schedule. She thinks we should get to about five wins. BC is one of the most popular Universities on Instagram. A Florida writer who was embedded with the Gators during Urban Meyer's run in Gainesville is now coming to his defense. The post is long and touches on many of the criticisms lobbed at Meyer, but the reason for the defense starts and ends with Aaron Hernandez. What I find interesting is that the writer is now saying Meyer was against recruiting Hernandez and only did so after an assistant persuaded him. This is what I learned about how Hernandez got to Florida. He was recruited by an assistant coach from Connecticut, who knew of his checkered past. Meyer balked at recruiting him. Partly because one of his assistant coaches was so passionate about signing Hernandez and partly because he became convinced “the mission” could change him, Meyer recapitulated. The writer, Buddy Martin, knows that Steve Addazio was the "assistant coach from Connecticut." So would most of the readers and college football fans. 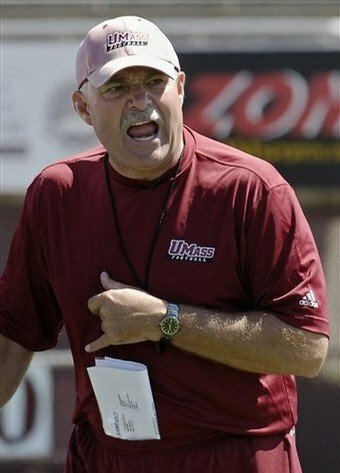 You can even look at Hernandez's recruiting profile to see that Addazio was his recruiter. Yet he doesn't name him. Why? Because he knows it is not fair to blame Addazio for Hernandez. But Meyer still wants to shield himself and look innocent. That's been his modus operandi for a long time...even if he points the blame at his loyal and long-time assistant. Nothing is ever Urban Meyer's fault and god forbid he doesn't control every aspect of his image. I can't speak to how things were run in Florida, but I don't blame Steve Addazio. I also don't blame Addazio (or even Meyer) for Hernandez's murdering someone now. Hernandez is an adult acting on his own. Do we blame Kraft or Belichick? No one could have predicted things would end this way. Addazio recruited Hernandez because he was in his territory and he was a great player. BC recruited him too but he didn't give us the time of day (and it was our TOB-Jags transition class). I don't know if Addazio cares about what Meyer's defenders are doing, but throwing him under the bus even if it is by geography (Connecticut assistant) rather than name is a cowardly move. I hope Martin and/or Meyer apologize to Addazio. BC is still one of the least expensive BCS game day experiences. As you can see, the list is filled with ACC teams. I am sure some of you might want to know more about the list's methodology (did parking and donations factor in? student seats? ), but it shows BC still offers value. In my opinion we don't market the value enough given how expensive other sporting events are in the Boston area. BC has an offer to Florida QB Sean White, but I don't expect him to be the our second QB. Sailors Molly Clarke and Kelly Roy earned ICSA All-Academic honors. #SharkNado the movie wasn't as good as the book was. One consistent complaint all of us share is the lack of preparation many broadcasters have when covering BC. Names are mispronounced. Generalizations and stereotypes about BC and Boston are embraced. It has become funny because it is so frustrating. The further down the TV scale you go, often the worse it gets. There is good news on the horizon though as Wes Durham will now cover ACC football and basketball for Fox Sports South. Most of you don't know or care about Durham, but he is the radio voice of the Falcons and has been the radio voice of Georgia Tech for the past 18 years. He's also hosted one of the best college football radio shows I've ever heard. Wes calls a great game and also does his homework. I've heard him talk about BC repeatedly and he doesn't just regurgitate the standard cliches. Because his contract is with Fox Sports South, he will probably call a fair bit of BC games as we rebuild. ESPN and Raycom will still pick the first four ACC games each week, leaving Fox Sport South the right to pick the fifth or sixth game (which Wes will call). Those games will then be available on your respective regional Fox Sports Cable affiliate. A mediocre broadcaster doesn't ruin a game, but a great one can make it better. I don't know how our team will play, but having a few Wes Durham calls ahead is something to look forward to. On a slow news day, Nate Freese making the Groza list makes for headlines. I am glad BC is supporting the effort, but I don't think Nate score enough to win the award. Story behind D.J. Gillens' switch from BC to Wisconsin shows how fickle the recruiting process can be. The Flames are patiently waiting for Gaudreau. I did not realize the Colts paid a premium to sign Emmett Cleary as an undrafted free agent. That doesn't mean he is a lock to make the team though. For those who missed it, here is CBS's Morning Show's piece on former BC assistant Don Horton. Horton suffers from Parkinson's and his wife has built a business around shirts that he can button via magnets. -- Not so new offense. At this point Rettig is used to learning new offenses. The difference this year is that he already has a relationship with his OC. Vernacular might be different. The devotion to the run game might be new, but BC is still going to pass. We have to as it is only thing we know we can do. I expect Rettig will still put up good yardage numbers, but think the running game focus will help his completion percentage, sacks and turnovers. -- The new staff loves him. That's the word on the street anyway. I think that confidence and aggressiveness will lead to improved play. It will also lead to influencing ACC voters. If the coaches are talking him up and he is backing it up with decent numbers, Rettig will get some "All ACC" love. -- The other ACC QBs are not good. Who is really going to finish ahead of him? Boyd is probably first team, but are there any greats ready to fill the void around the conference? I like Rettig's chances. If we get to six wins, he is a lock for All ACC. If you can't already tell, I am getting very optimistic about this season. I had the same optimism about Rettig last year but he couldn't overcome Spaz. Now he is a year older and wiser. He's seen it all. I think that experience does slow the game down and makes things easier for him. Throw in an aggressive mindset and I think you'll see more productivity and improved efficiency. D.J. Gillins verballed to Wisconsin. Since he would've been the second QB, I don't view it as a huge loss. He would've been more of a nice to have. The question is where does BC go for its second QB? We know that Addazio is pushing to fill out the class. Rivals lists plenty of uncommitted guys as still interested in BC. Lots of speculation is going around. Miles Wright and JuJuan Lawson are favorites and John Wolford is still out there as a potential target. The good news is that it was still a busy day for BC recruiting. Michigan Running Back Richard Wilson committed to Addazio. Wilson is not an elite recruit, but does add some nice depth. He might play on the defensive side of the ball based on how the class shakes out. Monday will be a critical day for BC's recruiting. Florida QB D.J. Gillins is supposed to announce his decision. Based on recruiting efforts, BC will take two QBs in this class. The second slot is Gillins now. He's a talented dual-threat who could push for playing time the moment he steps on campus. Most experts think it is down to BC and Wisconsin. If Gillins is a badger, BC will move quickly on some other potential QBs. -- Addazio is more than just "rah, rah" and high energy. There is some simple sales strategies and statistics at work here and that is a good thing. I don't know if this is his original thought or he is adapting from other coaches whom he worked under, but having X amount of prospects that require X amount of contact and calls per week is familiar to anyone who has worked in Sales before. You are never going to close every deal in football or business, so you need enough prospects lined up to reach your goals. It is a simple concept, but one that has been lacking around BC. Too often the past four years we went from our A List to our C List without any rhyme or reason in between. -- Institutional guys are buying in. Most programs have a few coaches and guys who have been around a while and have seen many come and go. BC has two on staff now in Kevin Lempa and Al Washington. Both have been part of multiple BC regimes and know what works and doesn't. Both are quoted in the article and seem to be enjoying the new culture. -- #beadude is going to get played to the hilt this fall by the media. I like the idea behind Don Brown's viral hash-tag. But as we know a good thing can become a tired cliche when we hear about it every week. I predict it will get mentioned weekly in our games and will be all over the feature articles this fall. I will try to keep from rolling my eyes as long as recruiting is going strong. I also expect Brown's magic to keep us competitive this fall. I do feel for him that he didn't trademark the phrase as it will be on signs and t-shirts in the near future. -- High School Coaches talking about Spaz. The contrast in John DiBiaso's (Everett) and Greg Toal's (Don Bosco) comments about our former staff were telling. DiBiaso was more candid in saying the former was "all over the place." While Toal didn't defend Spaz, he did point out Spaz's success as a defensive coach. This is all validation of what most of us thought -- things were a mess under Spaz. And his staff not being cohesive was also a byproduct of the AD having influence in who was hired and who was not. None of us know if Addazio will succeed but I think it is clear he is in control. I also like that his "energy" is translating to critical high school coaches and players. Syracuse is still mad at BC for being picked ahead of them at the ACC Prom. Pretty sure ACC lifted its talking point of "football potential" straight from a 2005 Big East press release. Congratulations to @BUCoachStevens on new position as head coach of the @Celtics! Welcome to Boston! If you haven't been following Soaring To Glory's numeric previews, you need to use the Fourth to catch up. Here is 59. It looks like the Sabres are going to release former BC star Nathan Gerbe. Matt Ryan and Tom Condon have a chance to get Matt a massive new contract. But I do expect Matt to take a cap-friendly deal so Atlanta can keep surrounding him with talent. Here is a good preview of Maryland. How was BC not the low-point of last season? Former BC baseball coach Pete Hughes -- who recently survived a heart attack -- is leaving Virginia Tech to coach Oklahoma. From a baseball perspective, this is a major step up. It is also a huge salary boost. When Hughes left BC, it was because he wanted to go to a program with a commitment to baseball. He turned those resources into a Virginia Tech NCAA tournament appearance. I don't think many of us realized what Hughes would accomplish after he left BC. Best of luck to him and I hope that if BC makes a commitment to baseball, we will finally end our current tailspin. Jared Dudley was part of a huge, three-team trade in the NBA. He's now a Los Angeles Clipper. I am sorry for the BC Club of Phoenix, since Dudley was a nice presence locally and was fairly active. But for Jared this is great news. He joins a team that wants him and returns to Southern California. The Clippers should be one of the better teams in the West and Jared will get to be a critical contributor again. Los Angeles is not a bad place to build your growing media career too. BCEagles.com posted a Q&A with former star Victoria DiMartino. I've read multiple previews that put Chase Rettig at the bottom of ACC QB Rankings. Even if you don't think much of him, I don't think his track record should put him at the bottom. Thankfully this post puts him in the middle of the ACC pack. I will have my QB preview later this week, but I think Rettig is a pro prospect and one of the better QBs in the ACC. But all BC fans should prepare themselves for Chase's stats to decline this year. It won't be him though. It will be our offense. Temple fans are not as enamored with Addazio's Vines and catch phrases as BC fans are. Recent commit Ty Schwab says he's been a BC fan since he was a little kid. Minnesota basketball transfer Joe Coleman will not becoming to BC.